Delhi Police dept. This special Service Units are for Woman and Children. 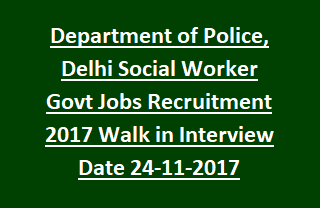 Interested candidates can attend the walk in interview held on 24/Nov/2017 for Social Worker posts begins from 09.30 am to 12.00 Pm at Office Premises of SPU (Special Police Unit) for woman and Children, Barrack no1, PTS Complex Malviya Nagar, New Delhi. Candidates must have to carry filled and printed copy of their bio data along with original/ Self- attested copies of Masters/ MSW/ MA degree certificates. Selection of candidates for this police department jobs is based on interview. More details regarding Delhi Police Department Recruitment of Social Worker, Capacity Support Officer Jobs Vacancies, Walk in Interview dates, How to Apply, Selection Process are given detailed below. The total available vacancies in Delhi Police Department Recruitment are 07 posts. 2. Social Worker: 07 posts. Selection of candidates for Delhi police recruitment vacancies will be shortlisted based on Interview. Interview for Social Worker Jobs will be held on 24-11-2017. Age of the candidate for Social Worker posts is 22 years to 45 years. Age of the candidate for Capacity Support Officer posts is 25 years to 40 years. Qualifications for Capacity Support Officer is Post graduate degree in Social Work/ Counselling/ Psychology with 4 years experience in the Social Development Sector in the area of Crisis intervention. Qualifications for Social Worker is Post graduate degree in Social Work/ Counselling/ Psychology with 02 years experience (or 04 years experience for the candidates with Bachelor’s degree in Social worker) in the Social Development Sector in the area of Crisis intervention. Candidates who are eligible for Social worker jobs with 2 to 4 years of work experience can attend walk in interview on 24-11-2017. The Registration process for these Police department vacancies begins from 9.30 AM to 12.00. Candidates must carry the filled and printed copy of their bio-data along with original/ photo copies of Master/ MSW/ MA degree certificates.